Former President, Bharrat Jagdeo on Tuesday railed against government’s suggestion that he could be stripped of constitutional immunity because he has re-entered active politics. Now Opposition Leader and General Secretary of his People’s Progressive Party (PPP), Jagdeo objected to Minister of State, Joseph Harmon’s view that the former Guyanese leader’s constitutional protection from prosecution in civil and criminal courts for official acts could be removed because he is back in the political limelight. “Harmon is wrong on this and as a lawyer I am so ashamed from him to think that anyone can remove a constitutional protection,” Jagdeo told a news conference. Jagdeo, who served as president from 1999 to 2011, also rubbished Harmon’s remark that the police could determine presidential immunity. “It is only the courts can determine these issues,” said the PPP leader. 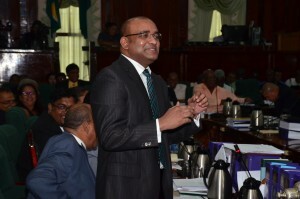 Jagdeo took up his constitutional office as Opposition Leader after the May 2015 general elections in January was elected General Secretary of the PPP. Investigators of the Guyana Police Force’s Special Organised Crime Unit (SOCU) last week arrested Jagdeo and questioned him briefly about his sale and acquisition of land at Goedverwagting- Sparendaam (Pradoville2). The politician has said he queried from investigators whether they were questioning him about his decisions made as President because he enjoys immunity. The former President has not given any clear indication on whether he would be willing to run again for the presidency if the Caribbean Court of Justice upholds a Guyana High Court decision that amendments to the constitution. Those amendments providing for term limits, the High Court says, are unconstitutional because they can only be made by a referendum instead of a two-thirds parliamentary majority.